The new app Likewise challenged former Bachelor contestant and podcaster Taylor Nolan to live on a houseboat for two weeks. But, there's a twist! Sponsored by Likewise. Seattle — Living on a houseboat for two weeks doesn't sound so bad. Neither does having your food delivered via kayak. Well, former Bachelor contestant Taylor Nolan is living that dream right now, all thanks to the cool new app, Likewise. Taylor Nolan is hanging out on a houseboat for two weeks- but there's a twist! Likewise is an app that gets you recommendations from people you know- not online strangers. Your friends on Likewise can recommend restaurants, places, movies, books and more. It's your one-stop shop for finding your new favorite movie or pizza place. And it's a totally positive community- there's no negative reviews, only recommendations. 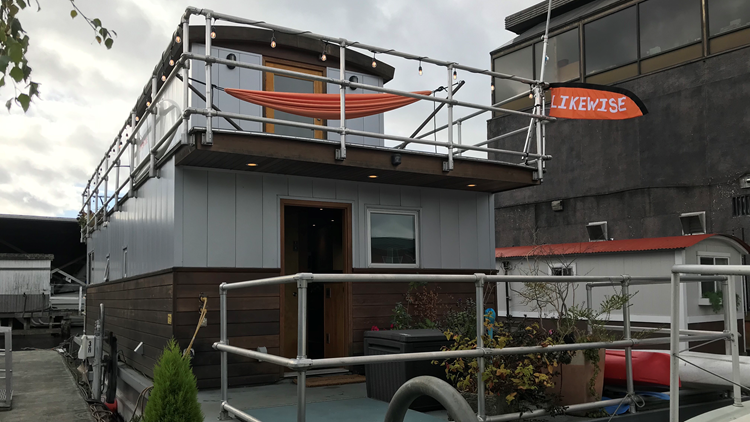 Likewise wanted to show just how much their app can do- so, they challenged Taylor to live on a houseboat on Lake Union for two weeks. But, there's a catch. Every restaurant she orders from, every book she reads, is decided by the Likewise community. "People have been sending in some really good recommendations," Taylor said. Some recommendations include the movie A Walk to Remember and the restaurant Portage Bay. But there's still time to send Taylor a recommendation! Just hop on Likewise, make a profile, and send a recommendation to @taymocha. This story brought to you by Likewise. KING 5's Evening celebrates the Northwest. Watch it weeknights at 7:30 or streaming live onKING5.com. Connect with us via Facebook, Twitter, Instagram or Email.